It would be great to have lunch every day at Higgins... get the lunch special or the burger, and have a cask-conditioned pint. But in these troubled times, when the "fiscal conservatives" who added $5 trillion to the national debt are overdrawn on their own bank accounts, some cheaper options are needed. Luckily, right around the corner from Higgins is SuperDog, a hole-in-the-wall hot dog stand that will pour you an Oregon pint for $3.75. There's a little bit of local-food action happening, with a couple of Zenner's sausages on the list, a different homemade soup each day, and a condiment table laden with an assortment of Beaver mustards. The number of sausage/topping options is truly bewildering, but most of them ring up to $5 or less. The people are friendly, they'll wait patiently while you figure it all out. On the other hand, the beer list isn't bewildering at all. They only have four taps, but they're good ones, again with a local emphasis. On my first visit, when I saw the Lucky Lab tap handle and asked which beer it was, I was given a classic "Well, duh" look. "Super Dog, what else?" Good choice. Super Dog is one of my favorite Lab beers right now, a nice big IPA. Besides that, they always pour Laurelwood Free Range Red and -- representing the world outside of Oregon -- Anchor Steam. The fourth tap is dedicated to Klamath Basin Brewing -- whoa, that's obscure. Extra community service points for that! For a long time SuperDog had Klamath's Cabin Fever Stout, which I kept meaning to try but somehow always ended up with a Super Dog. Last week the Klamath selection was Drop Dead Red, which is a smooth and easy red ale, more like a less-hoppy version of the Laurelwood than bigger reds like Roots or Lagunitas. 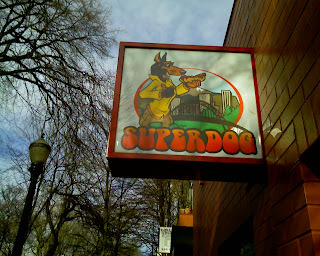 That's the story of the other Super Dog: it's a friendly place for a quick cheap bite if you're near the South Park Blocks, and you can't go wrong with any of the drafts. If you need to save an additional dollar, after 4 PM you get $1 off your beer when you also order a dog.